Workshops are available for the following: parents, boards, primary teachers (JK – grade 3), university concurrent teaching programs, professional development days, conferences, and summer institutes. Background research and data that show the importance of teaching children how to look at print in a box framework in the early years. 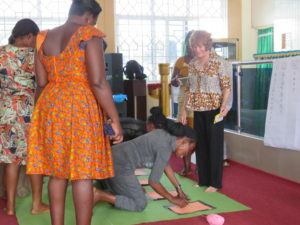 Demonstrations of how a mat is used to improve children’s processing skills in both math and literacy, in a fun, easy and active way. Hands-on workshops are available. An overview of the units including concepts covered, applications to the curriculum and foundations for future learning. An outline of the benefits of using the program as an early intervention tool for both teachers and children. Having a common language for math and literacy, teacher and children, has amazing benefits and is extremely useful.